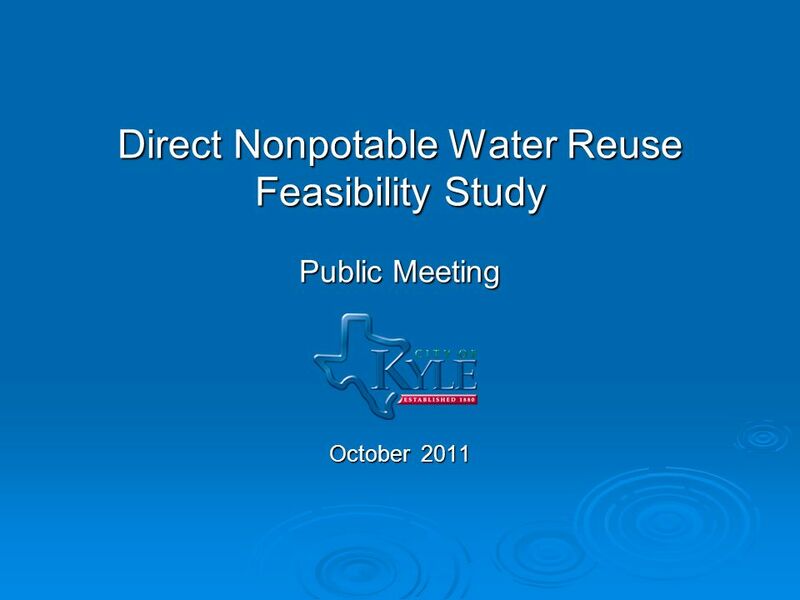 Direct Nonpotable Water Reuse Feasibility Study Public Meeting October 2011. 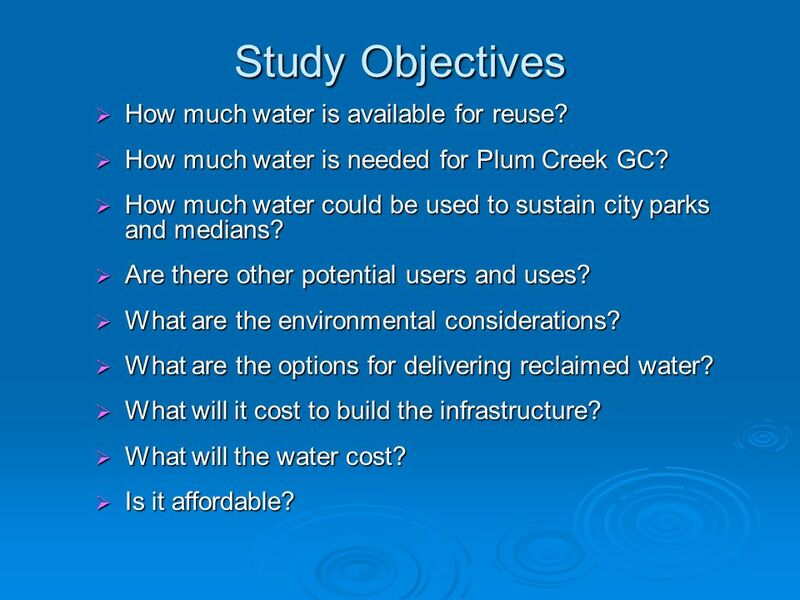 15 Study Objectives  How much water is available for reuse? 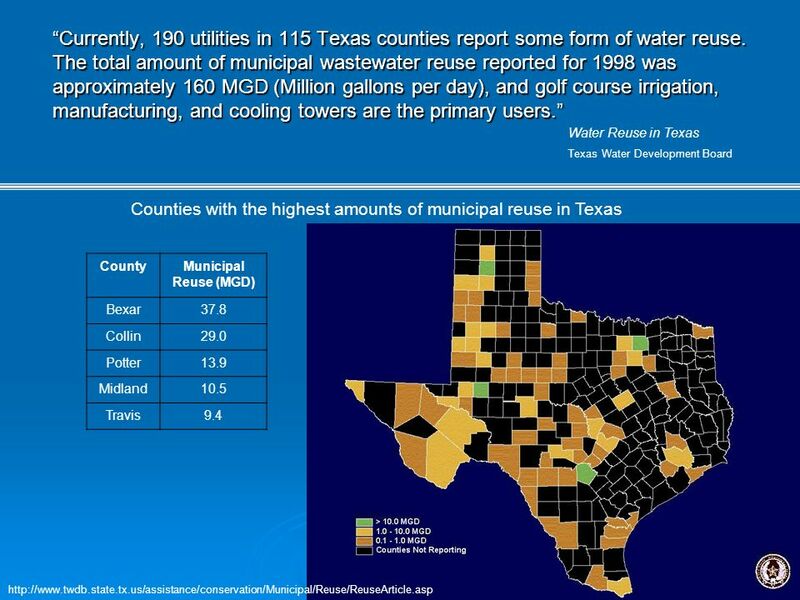  How much water is needed for Plum Creek GC?  How much water could be used to sustain city parks and medians?  Are there other potential users and uses? 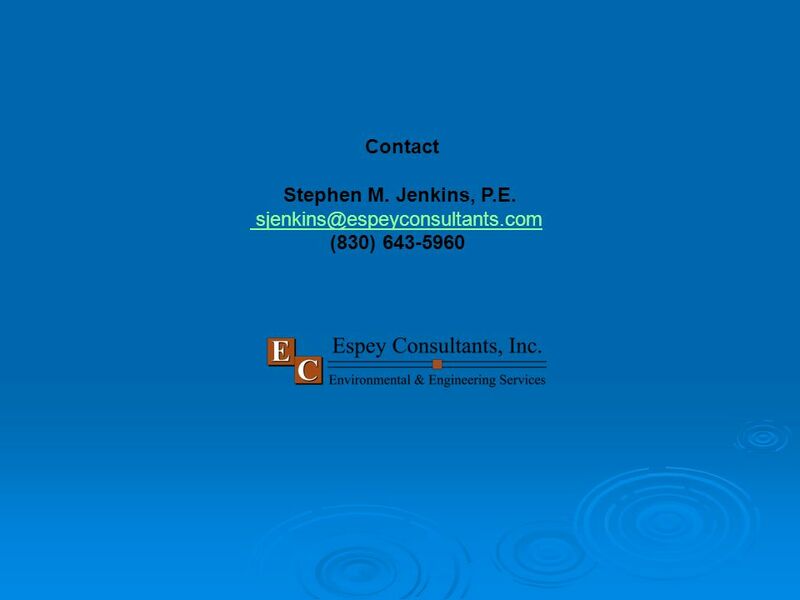  What are the environmental considerations? 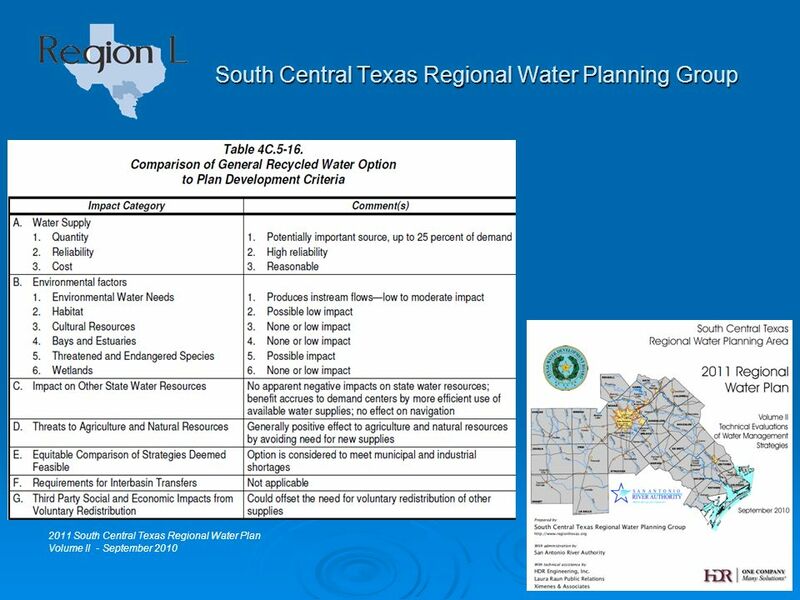  What are the options for delivering reclaimed water? 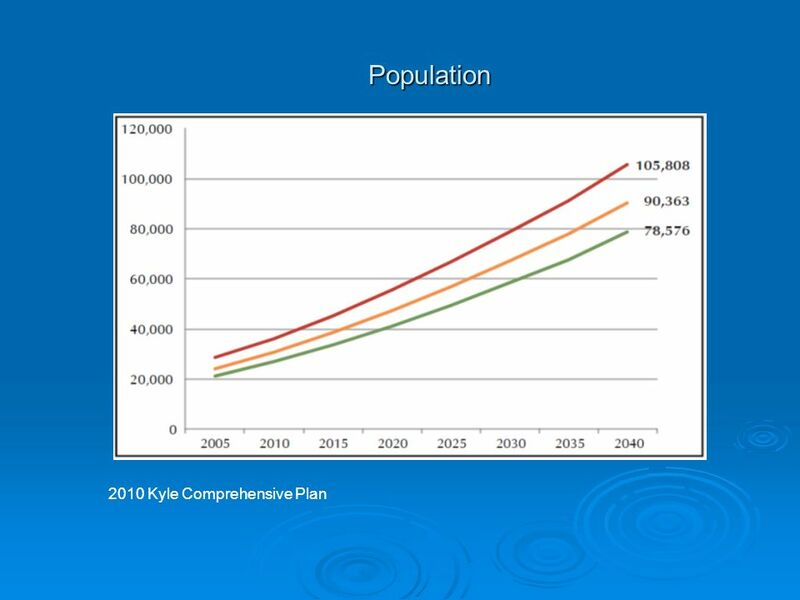  What will it cost to build the infrastructure? 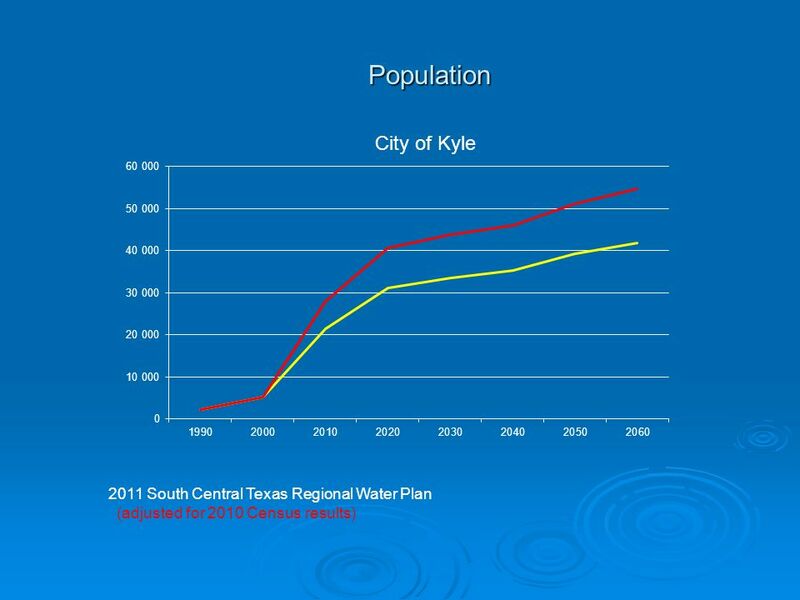  What will the water cost?  Is it affordable? 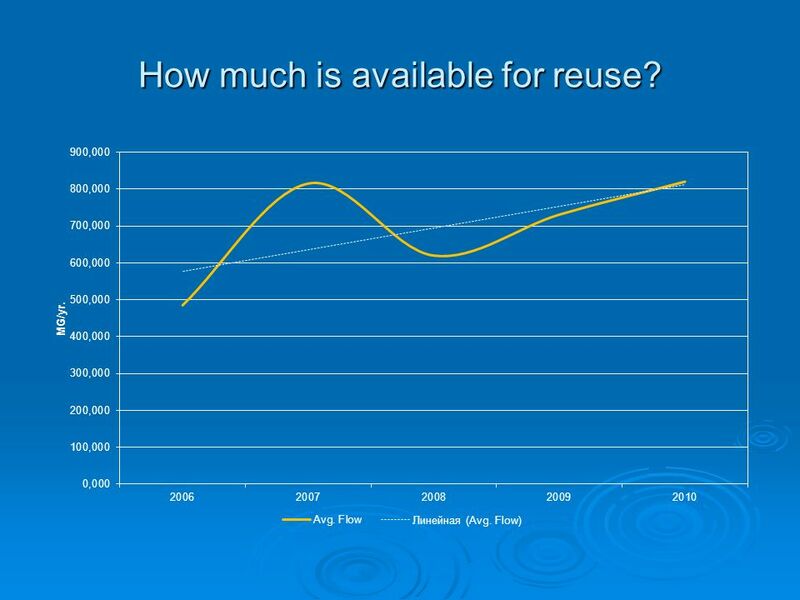 16 How much is available for reuse? 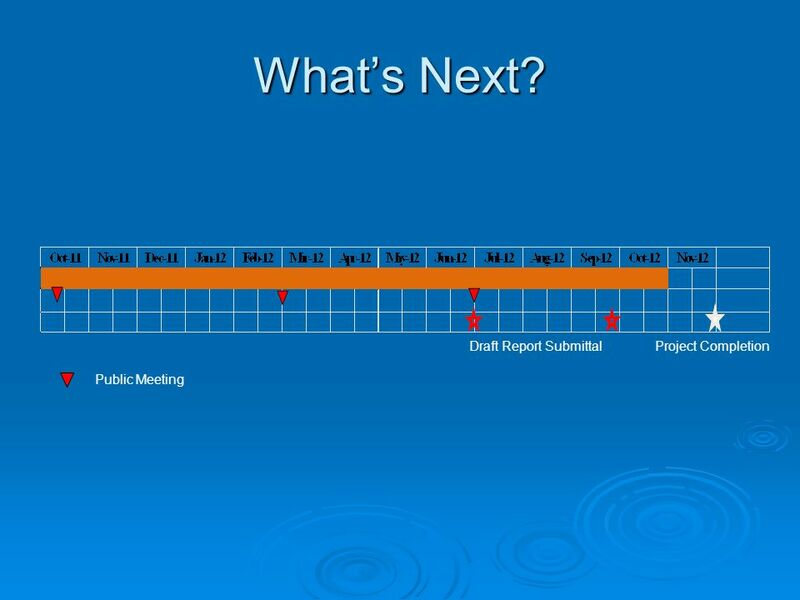 Download ppt "Direct Nonpotable Water Reuse Feasibility Study Public Meeting October 2011." 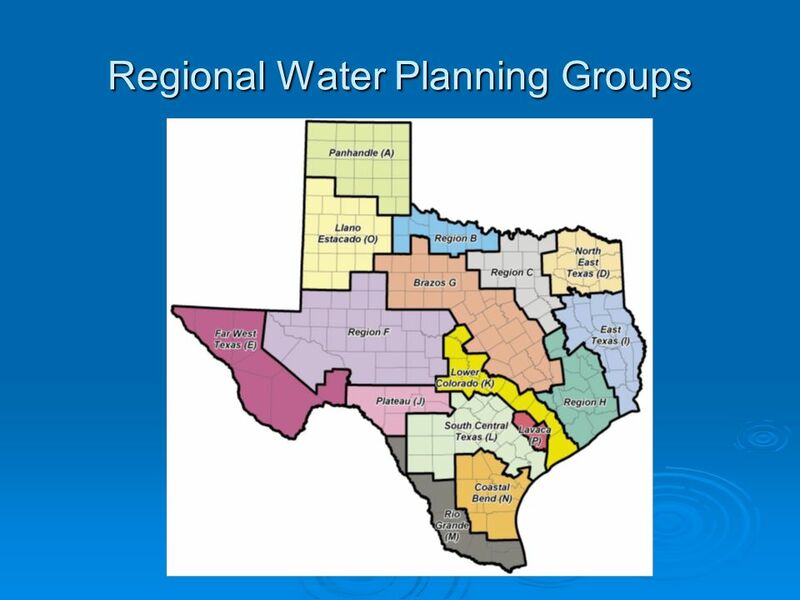 Regional Water Planning Senate Bill 1 Introduction and Status as of August 01, 1999. 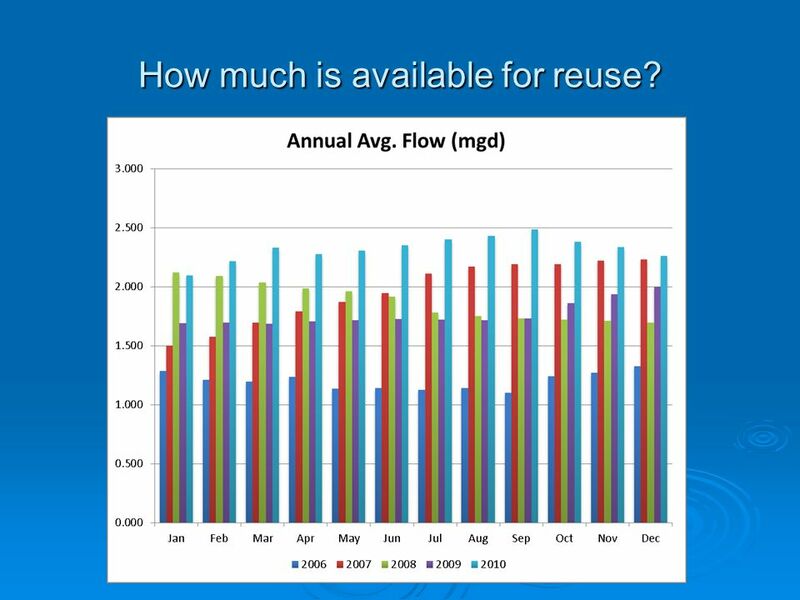 WASTEWATER REUSE CRITERIA IN GREECE A. Andreadakis, E. Gavalaki, D. Mamais, A. Tzimas National Technical University of Athens, Faculty of Civil Engineering. 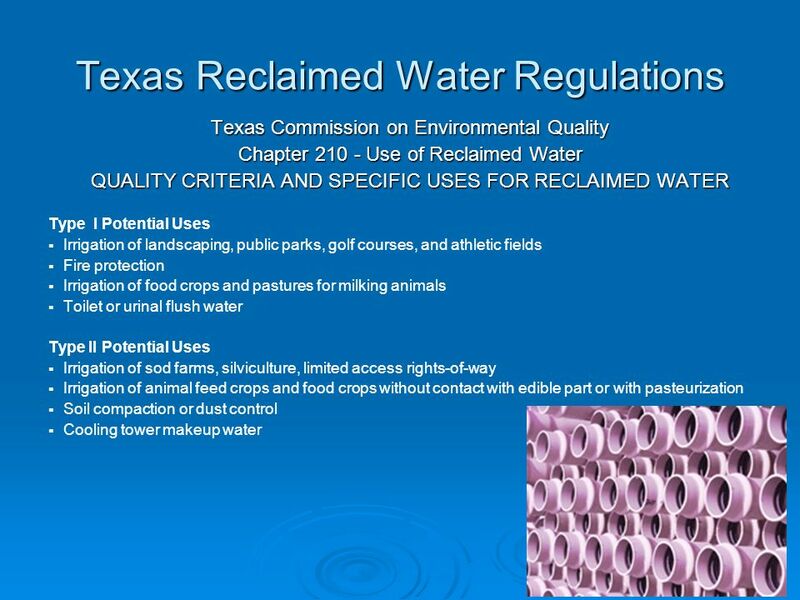 Treated Wastewater Reuse For Landscape Irrigation and Amenity Lake Evaporation Make-Up Presented to: Houston Land/Water Sustainability Forum May 13, 2008. 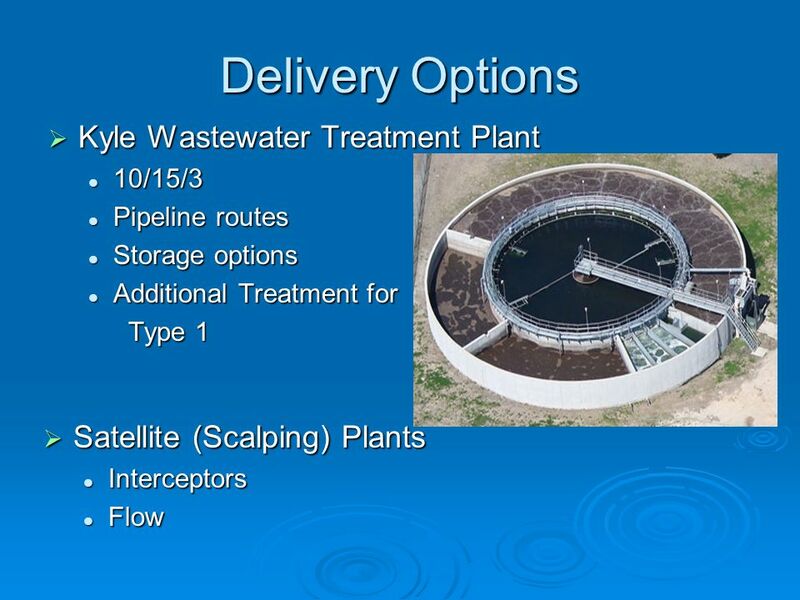 Paving a Path to Potable Reuse Flexible Treatment for To Be Determined Regulations Michael Watts, PhD, PE Water Technology Leader Garver. 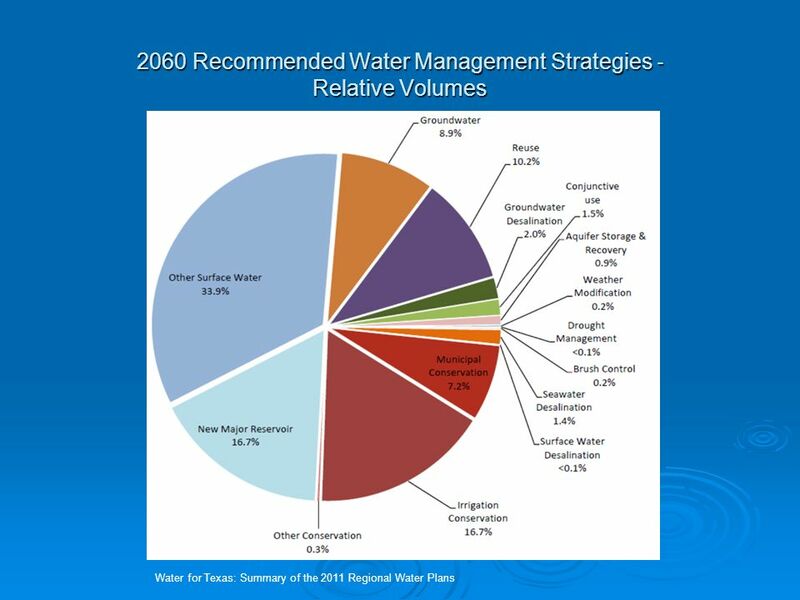 Moving to the Next Level of Water Use Efficiency in Florida Janet G. Llewellyn, Director Division of Water Resource Management Florida Department of Environmental. Harris County Onsite Wastewater Reuse Program John Blount, P.E. Director of Planning & Operations. 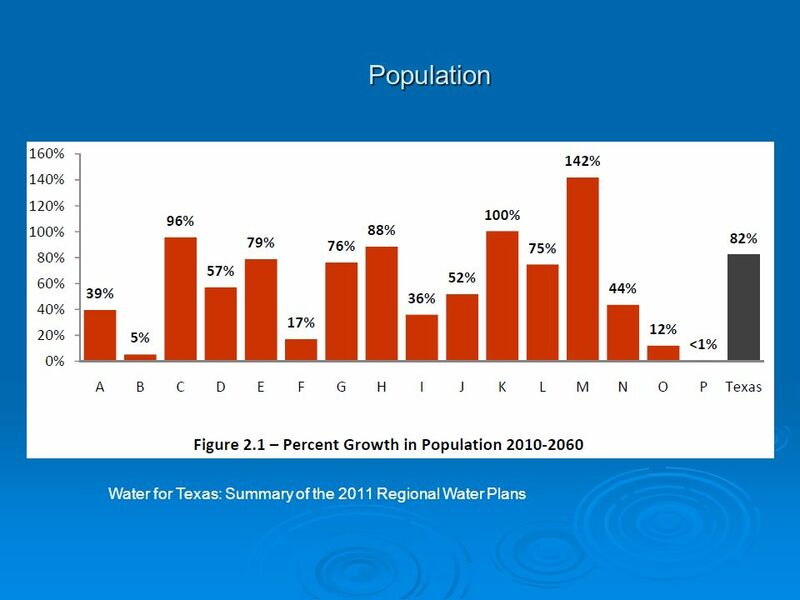 Water for Texas 2012 State Water Plan. 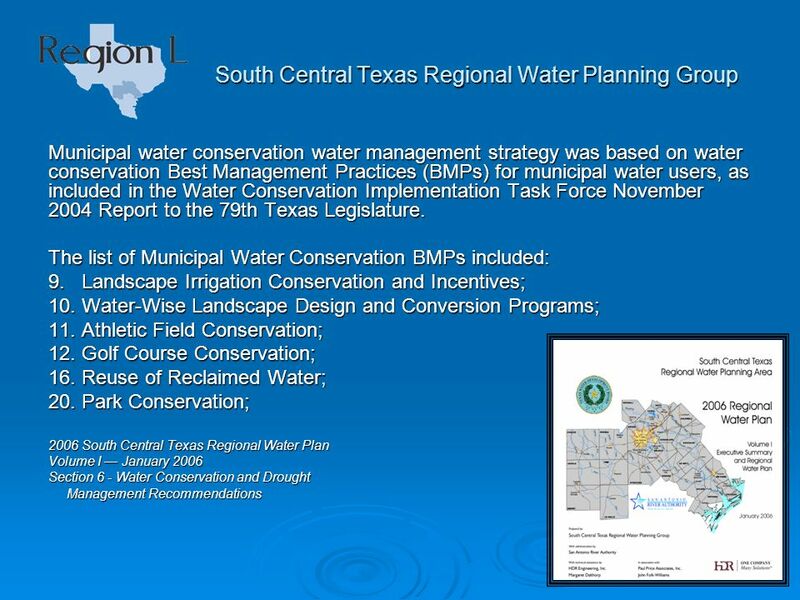 Water Planning: Legislative Response to Drought  Late 1950s Drought of Record – 1957: Creation of TWDB – $200. 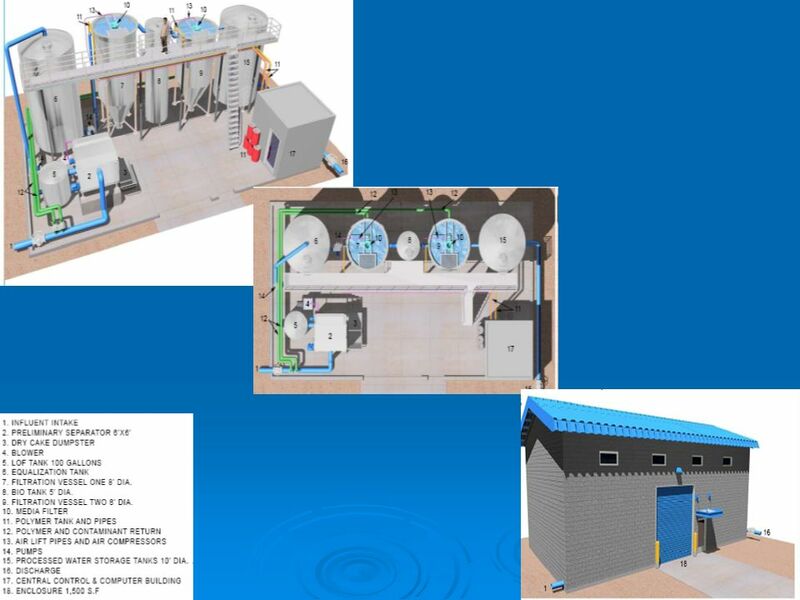  Why  Project Status  Future Course Lime Sludge Biosolids Water/Wastewater System Life Cycle Raw Water Wells (12) Water Treatment Plant Storage Tanks. Fort Bliss Energy, Water, and Solid Waste Sustainability Initiatives Draft Environmental Impact Statement (EIS) Public Meetings June & 13, 2013. Innovative Green Building - High Rise Residential - Water Reuse American Water Applied Water Management Group. Kara Denney Industrial Wastewater Permit Writer Water Quality Division. 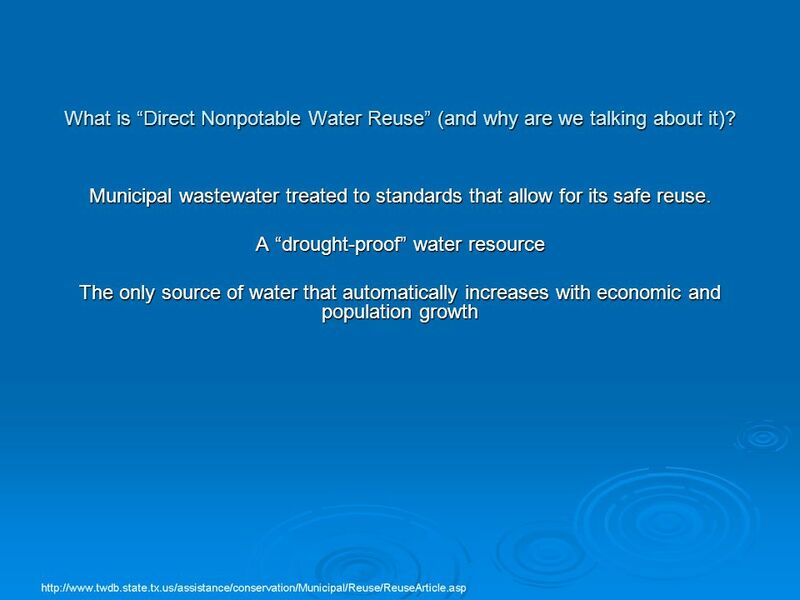 Reclaimed Water–A Sustainable Source for Florida’s Growing Water Needs Larry R. Parsons, Ph.D. Citrus Research & Education Center Lake Alfred Liz Felter. 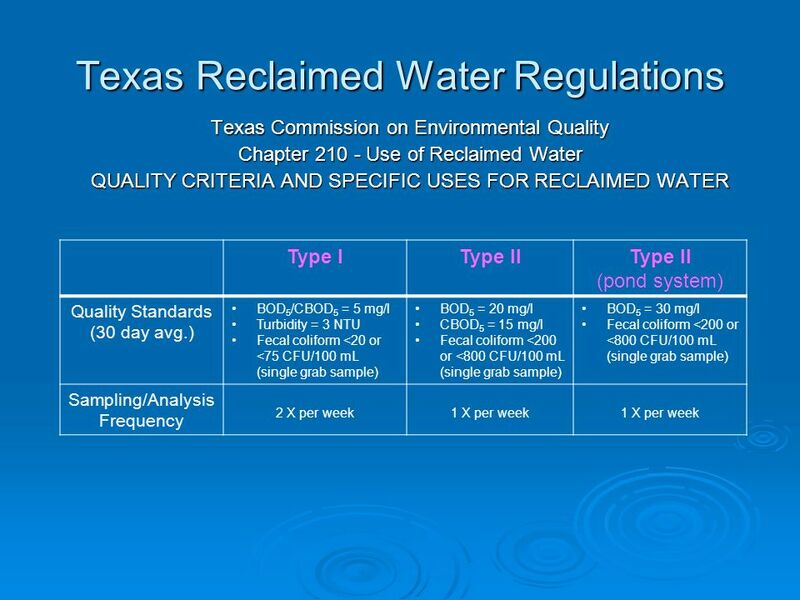  Oklahoma Department of Environmental Quality Water Quality Division Tim Ward, P.E. 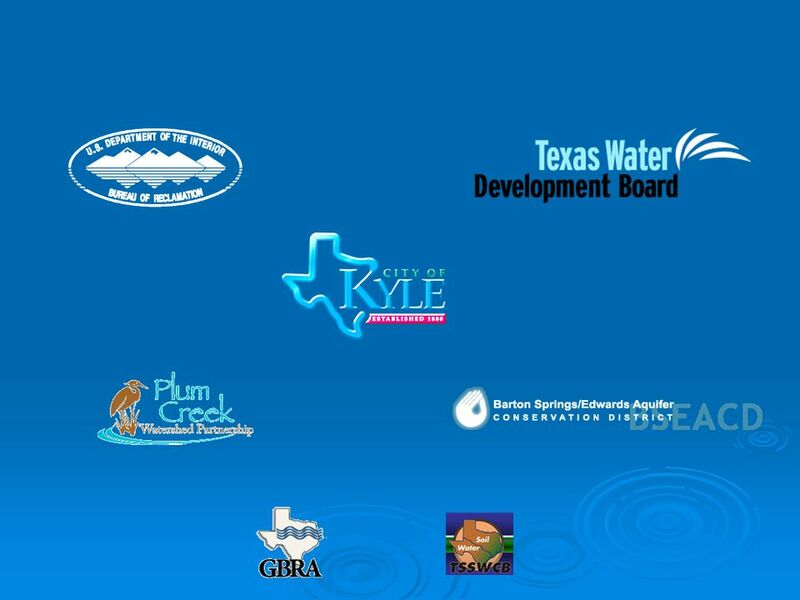 OML Water Summit.